Yes, it will be the end of paradise as we know it if we continue on the warpath against our blue environment. From Cape Maeda (Maeda Misaki) to Oura Bay and from sea to shining sea we have five years to turn the tide towards restoring resiliency. Every square meter of living ocean is a legacy for the future. Our Grand Blue Okinawa Ocean, is part of our planet’s blue heart. Green and Bluewashing at its best: Advertising for the 2015 opening of the ENZO Pizza and Wine restaurant as they promote the “Endless beauty of ocean” appealing to keep the beach clean, while blocking the ocean and sunset view. Maeda Misaki (Cape Maeda) will be home to a new development promising “healing, relax and connection to the environment”, yet the local community of Maeda is not happy with the present situation. Its being marketed to people in mainland Japan as a second home for resort living. The news about the new mansions last June, came as a surprise to the hamlet even though the project was being backed by a few Onna Assembly members. Lots of questions, lack of transparency and the rush to promote the project has created an atmosphere, which needs attention before healing can really take place. The beach below is an important Sea-turtle nesting beach. Complaints were made to the Onna Village Planning Department when residents found that the beach was being advertised as a “private beach”. The company quickly changed the on-line text to: “a natural private-like beach”. To top off the local ire, the developers have put up a huge billboard sign to promote the planned restaurant ENZO (in reference to the Grand Blue diving hero). 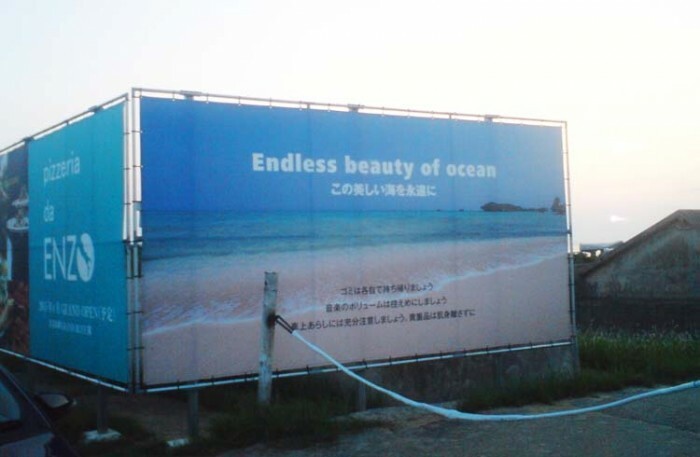 The sign reads: “Endless beauty of ocean” yet blocks the ocean view at this high spot. This is a classic example of “Greenwashing,” or shouldl we say “Bluewashing” at its worst. These things have eroded the trust in “Best Planning Ltd” to respect the spirit of the Maeda community and the environment right on this Quasi-National Marine Park coast. The Maeda-Misaki Grand Blue project is led by Best Planning Ltd (with Osaka roots), Yell-Pro Co. and Nikken Resort Co. as its agent for the main points of contact. Dialogue is needed. The local residents will be drafting a list of requests and guidelines. It is feared that many of the units will be sublet to tourists making it a de-facto resort hotel without the accountability of a hotel. A win-win-win situation is needed. Steps are being taken by the companies in charge to restore trust with the community and not just trust in profits. Many of us “ocean lovers” remember fondly the classic ocean movie “Le Grand Bleu” (version longue). Known to USA fans as “The Big Blue” (short version). It is a fictional tale based on true free diving and loosely on the world champions Jacques Mayol and Enzo Maiorca. It is important for a project that relies on the aura of that great movie to become a steward of the environment and its biggest marketing point: “The big blue ocean of Cape Maeda!” Together with those who have been watching over the sea turtles at Cape Maeda and keeping it clean, we will be happy to help them become the stewards they need to be. Otherwise, potential buyers are being lured in with false advertising as our “Grand Blue Okinawa Ocean” cannot be taken for granted. Calls to the companies have not been returned. Although the project is within Okinawa Prefecture regulations, there is a local ordinance that for buildings over 20 apartments, need to be approved by the mayor. Building has already begun pending approval by the mayor. Elections came and went. No speeches here. An on-line petition is being considered to request that Best Planning Ltd. restore the view of the ocean and bring up their environmental standards to reduce any negative impacts on the blue, the green and the community. A call to Action: The “Our Ocean” conference hosted by Secretary of State John Kerry with remarks by His Serene Highness Prince Albert II of Monaco were joined by ocean heroes including Dr. Sylvia Earle and Leonardo DiCaprio. We were reminded that we all share “One Ocean” and would like to appeal to those heroes to think of other alternatives instead of land filling Oura Bay across from the Kanucha Resort. All initiatives are appreciated for protecting the oceans in the USA and Hawaii. We are connected. The Showa Emperor’s release of his life story documented by his close aides, have reminded Okinawa about the “Tenno Message” which I covered in the last week of August (Shinto Abe…). The national news focused on the Showa Emperor’s (Hirohito) war stance, his travels and his boyhood joy of having his father attend his elementary school “Undokai” – sports day. Lots of insight but no intent on “Historywashing”. According to the August 21 Ryukyu Shimpo, Keiko Itokazu, an Upper House Councillor on August 20th attended the UN Committee on the Elimination of Racial Discrimination Session in Geneva Switzerland appealing to save Oura Bay. After she was asked by a committee member, Ms. Itokazu explained about the 500-year-history as an independent nation and the Ryukyuan language being recognized by UNESCO. In 1998, during the International Year of the Ocean (IYO) Jacques Mayol visited Okinawa. Next week, Cape Maeda and the Grand Blue movie connection.